I have been using hair extensions now for over 10 years. They are definitely one of my biggest guilty pleasures. I have pretty thick hair anyway so I have always used them for length more than thickness as I just love long hair, the longer the better to me. I have tried pretty much everything; human hair, synthetic, clip ins, glue in and had way too many weaves sewn in. The one thing I am sure about however is that I prefer human hair extensions 100% over synthetic hair. It just looks so much more natural. So I was thrilled when UU Hair Extensions* asked me to have a look at their range of hair extensions. I personally always choose 18 inch clip ins. 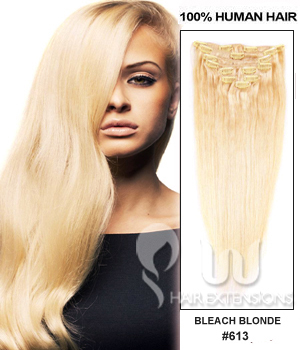 They are the perfect length for the look I desire and the clip in hair extensions are the best way to wear hair extensions without actually damaging your hair. 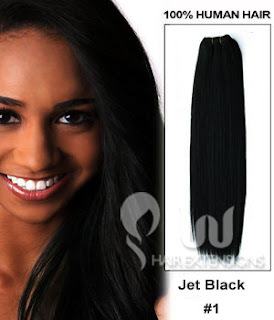 If you are looking for very long hair to your waist then have a look at their 18 inch hair weave. The 18 inch Medium Brown(#4) Straight Indian Remy Hair Weave matches my hair perfectly. The hair is 100% Indian Remy Human Hair and comes straight but as it is human hair, you can curl or straighten it just like your own normal hair. 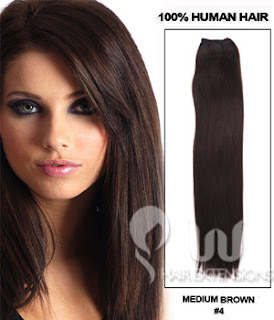 For $77.55 (works out to be around £50) it is a very good price for the quality of hair that you get. If you are looking for hair that isn't too long, then I would recommend trying the 16 inch hair weave instead which are listed here. These give a more natural look and would come half way down your back. However if you want hair extensions and still unsure as to what to buy then have a look on their best selling clip in hair extensions. The reviews for the extensions on their website are fantastic with the majority of the products being given 5 stars. I just wish I had known about this site before as I admit I have purchased some very bad quality hair extensions over the last 10 years. Do you use hair extensions? Has anyone else tried hair extensions from UU Hair Extensions? *This is a sponsored post, however all opinions expressed are entirely my own. Hair grow faster solutions! love them! I never used extensions before, not to brag but I'm blessed with very thick hair and relaxed. But I've seen my friends' hair extensions and t is really important to invest on something with good quality. I used it before and i love it, but since i cut my hair i am kinda miss it! I haven't used hair extensions before however I like the look of natural ones. I don't have thick hair but really flat so I might think about using them eventually. Great post! I can't live without extensions. I’ve always wanted to try extensions since my hair seems to stop at a certain point. Will have to keep these in mind! I used to use hair extensions before when my hair was still short1 but haven't tried clip ins. And now that it's long enough, it's my best option to use clip ins like this ones if I want to make my hair look thicker with some hairstyles. Thanks for sharing, hun and have a lovely day! I don't use any and haven't tried them, but these look great! Amazing extensions! Have a nice day, dear! When I was younger I always wanted to try out extensions, these sound great! I've never tried any hair extensions before, but now that my hair is so short it might be something fun to test out! Great post!